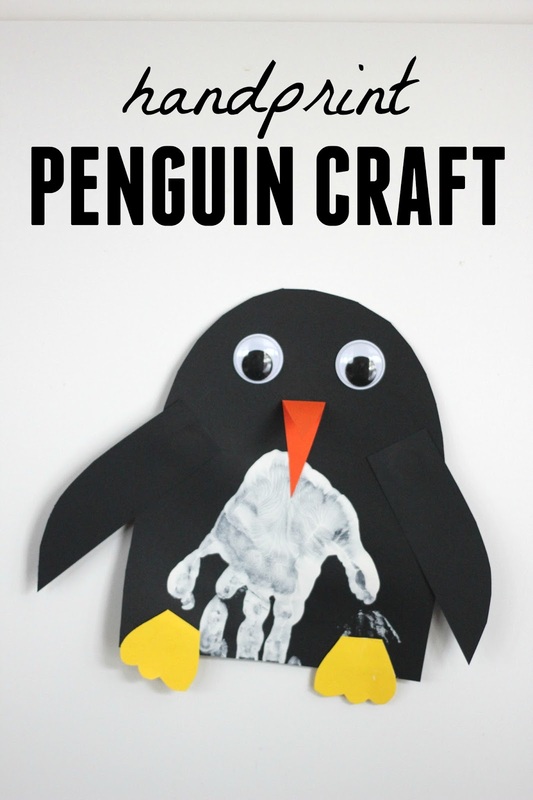 Penguins are such a fun animal to learn about during the winter time (or really any time). My kiddos think peguins are adorable, so today we decided to make a quick and easy handprint penguin craft. We love to use handprints in learning activities and crafts. 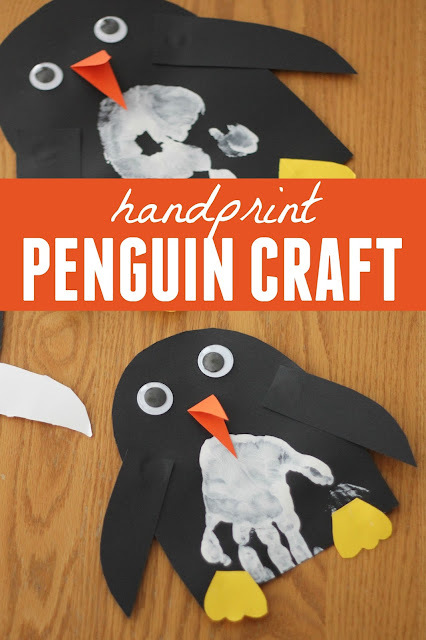 Our handprint penguins don't need very many materials and are quick to make. 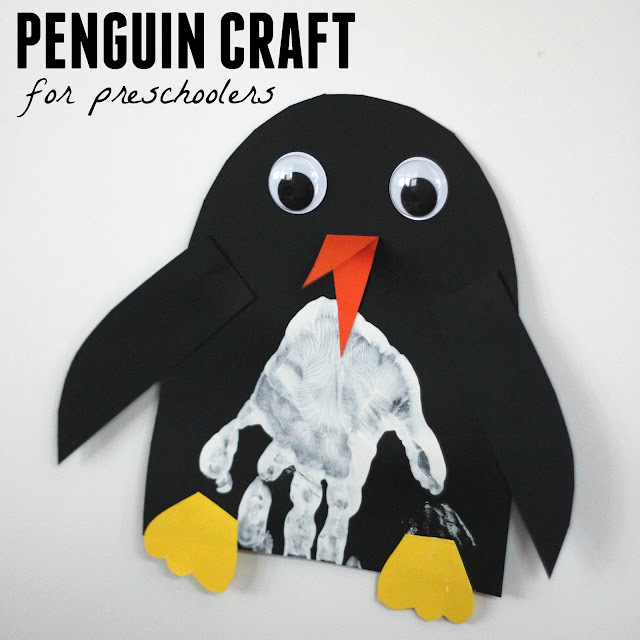 To get started we cut out a penguin body from black cardstock. 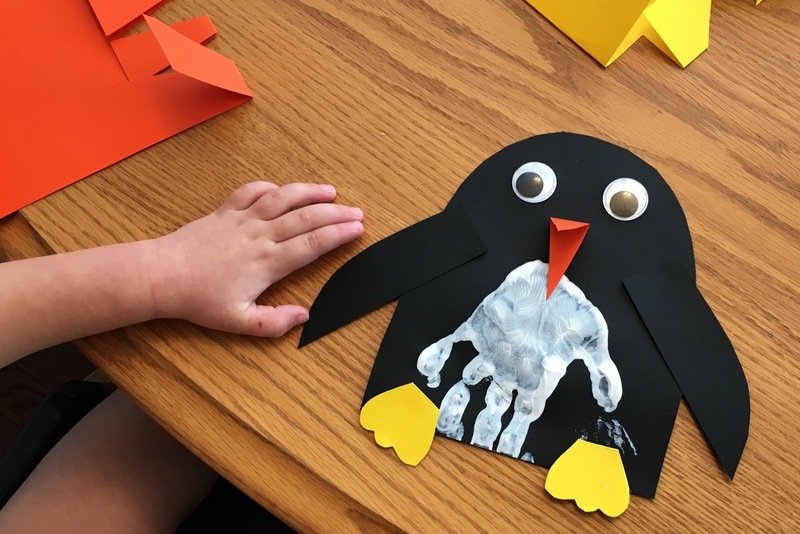 My 5-year-old cut out her own penguin body (cutting along lines that I drew) while I cut out the body for my 3-year-old. 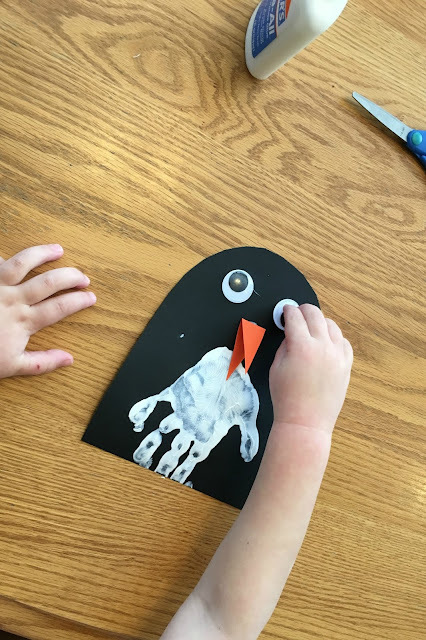 Next we put white paint onto a plate and each child covered their palm in paint and stuck a handprint onto the black cardstock to make the penguin belly. After that we added googly eyes and cut out simple beaks and feet from colored cardstock. My daughter came up with the brilliant idea that the penguins needed wings (duh!) so we added those too using scraps of black paper. This craft allowed my 5-year-old (who is in pre-k) a chance to snip and cut a bit and practice simple scissor skills with a little help from me. Both my 3-year-old and 5-year-old thought it was so fun to fold over the beaks and cut small triangles so that the beaks popped off the page and were 3-dimensional. We all made our feet and wings a bit different. I made my feet into hearts and my son wanted his to be bumpy. My daughter wanted white wings and the rest of us wanted black ones. Once we were done with the penguin craft we let everything dry and then the kids had fun making their penguins move around.